Teachers work with students to help them learn and apply concepts in science, math, language arts, music, and social studies. You can work in private and public schools, and you can pick a classroom setting from preschool through postsecondary. As the teacher, you will be responsible for planning lessons, assigning projects, and grading assignments. The speciality you chose will determine your personal educational requirements. A bachelor’s degree in education is usually the basic hiring demand. Once you graduate, you will have to sit for the licensing exam given by your state education board. You’ll be tested on your competency in reading, writing, and ‘rithmetic, along with other basic educational skills. Find an education program in your area. As an early childhood educator, you prep children with the foundations their educational careers will be based on. Early education is the period of time in a child’s life before the age of eight. During this time, children are in the most rapid phase of growth and development, where their brains develop faster than any other point in their lives. The groundwork for their social skills, self-esteem, perception of the world, and moral outlook is established, as well as their cognitive skills. Your teachings are especially important in order to encourage healthy development of these footings. Teaching young children is a highly specialized field. Each state sets its own standards for what’s expected from qualified teachers. To be qualified to teach through third grade, some preschools will require a bachelor’s degree in early childhood education or child development. Many schools set their minimum at an associate degree—but having an advanced degree improves your abilities, job prospects, and opportunity for career advancement. Finish high school and get your diploma. Gain experience working with children in a preschool setting. Most employers will expect you to have already established the basic skills of working with small children. Get a degree in early childhood education. Complete your student teaching assignment. Become certified in early childhood education. Keep up with your Child Development Associate credential, a recommended earning that needs to be renewed every three years. When you have attained your degree, you will need to pass your state’s requirements to earn an official teaching credential. Once you are certified with the state, the most important way to build you career is through experience. A good way to build experience is through the Child Development Associate (CDA) credential. Complete a minimum of 480 documented hours working with children. Complete 120 hours of formal childcare education, which your student teaching can go toward. To take the CDA, you must have a bachelor’s degree in early childhood education. You will take a written exam, and be observed in your working environment to earn your certification. To maintain your certification and license, you must partake in continuing education credits. The employment for early childhood educators is expected to grow 10 percent through 2026. This is due to the fact that the number of preschool-aged children is on the rise. The more experience you have in early education, the better your job prospects will be. Preschool teachers median annual salary is over $28K. If you’re just starting out in your career, you’ll earn just under $20K on average, and if you’re established in your career then you’ll bring home an income of more than $54K. Kindergarten and elementary school teachers are usually qualified to teach through fifth grade. Some schools will allow you to teach up to grade eight. You will spend each school year in the same classroom, nurturing and expanding the brains of the thirty-some young minds entrusted to your care and tutelage. To begin your career as a teacher, there are a few basic steps you have to take. If you go to school full time, it should only take you four years to complete your elementary education degree. Get your bachelor’s degree in elementary education. Complete your supervised student teaching segment. Take and pass your state’s certification exam. Consider getting your master’s degree. Keep up with your continuing education credits for your license renewal. These vary by state. Middle school teachers are qualified to teach sixth through eighth grade. Most likely, you’ll specialize in a subject, or maybe two, and teach the students in those areas. Middle school is a tough few years for all involved, and you’ll be trained to properly deal with these beasts through psychology and social interaction courses included in your college curriculum. To begin your career as a middle school teacher, you’ll need a college degree and state certification. If you go to school full time, you should be able to complete your education degree in four years. You’ll first need a bachelor’s degree in a subject such as math, English, or a language, along with a minor in education. Complete your student teaching segment. Consider getting a master’s degree in education. Some states do require middle school teachers to have a master’s degree. Keep up with your continuing education/personal development credits. They are necessary for renewing your teaching certificate. Exact requirements vary by state. High school teachers are trained to educate students in ninth through 12th grade. If you choose to teach on the high school level, your job will be to prepare your students for a successful college experience. You will be specialized to teach one subject or a few, such as English, math, social science, or languages. To begin your career as a high school teacher, there are a few basic steps you’ll have to take. If you go to school full time, you should be able to complete your education in four years. You’ll need a bachelor’s degree in the subject you plan on teaching, along with a minor in education. Consider getting a master’s degree in education—some high schools require their teachers to have one prior to being hired. Keep up with your continuing education/personal development credits; they are necessary for renewing your teaching certificate. Exact requirements vary by state. To teach on the college level, you’ll specialize in a variety of subjects or fields within a department, and you’ll teach one or more classes in that specialty. Most likely, there will be a research and publishing component to your career too. Your exact responsibilities will depend on the college or university that employs you. To begin your career as a postsecondary teacher, aka college professor, there are a few basic steps you must take to get there. If you go to school full time, you’ll complete your bachelor’s degree in four years, but you’ll also need more advanced degrees as well. Typically, a professor working for a four-year university holds a doctorate in his or her field of study. Choose which field you’d like to specialize in. Subjects such as literature, language, science, math, and history are just a few of your options. Receive your bachelor’s degree in your major of choice, with an education minor. If you want to teach on the community college or technical school level, you’ll need to get your master’s degree. Some colleges as well will allow professors to teach with a master’s degree. Most universities require their professors to be, minimally, a doctoral degree candidate. Get your research published, especially in fields such as literature, math, and sciences. Throughout your entire education, you need to participate in internships and other forms of employment opportunities. Part of any college-level teacher education program has a semester, or eight to twelve weeks, that is geared toward student teaching on whatever level your real-life teaching will be. Consider it to be a sort of apprenticeship or internship in the field of education. It’s not a paid position, since it’s part of your coursework. Through student teaching, you will hopefully learn first hand how to operate a classroom full of busy children or rowdy young adults. You will be required to do whatever your coop teacher has you do, whether it’s lesson planning, sitting in on parent-teacher meetings, or running the class on your own while the teacher observes. Excluding special education teachers, elementary education educators can expect to make a median annual salary of $57K. Middle school teachers earn an average of $57K per year. The median annual salary for high school teachers is $59K. First year teachers for kindergarten through high school are earning in the $30Ks. And the teachers who have hit the top salary and benefit step make in $80Ks. Postsecondary teachers have a median annual pay of more than $75K, with some in the top tier of their profession earning well into the $160ks. Salary does depend heavily on the district and state you’re teaching in. Teacher salaries are often the first hit when school districts experience budget cuts. It’s very common for teachers to join their local teaching unions to keep their rights protected. Employment growth for kindergarten and elementary education teachers is 7 percent through 2026. Middle school and high school are at 8 percent. Postsecondary teachers have a 15 percent employment growth, which is much faster than most other professions, including other education fields. Some parents need a safe and secure environment to drop their children off at while they go to work. Child care workers not only provide the basics in care, they also can help prepare the children for preschool and kindergarten through educational play. Generally, child care facilities cater to children from infancy through preschool. Child care centers: Child care center professionals work in teams, often with preschool teachers and teacher assistants to teach children through a structured curriculum. You’ll prepare daily and long-term schedules of activities to stimulate and educate children in their care. You also monitor and keep records of the children’s progress. Daycare with a preschool teacher: You can begin work as preschool teacher aide or assistant teacher, which allows you to gain work experience should you decide to advance in the profession. Teachers can get jobs with early childhood schools or Head Start programs associated with a public or private school district. You can also find work with a private daycare facility. Child development teachers are responsible for teaching children through play, investigation, and organized teaching methods. Child development teachers encourage creativity, language development, and socialization through an age-specific curriculum. Family child care providers: Family child care providers care for children in the provider’s own home during traditional working hours. You ensure that your homes and the staff you employ meet the regulations for family child care providers. Manage in-home child care center: Many smaller childcare operations are run out of a child development teacher’s licensed daycare in his or her home. The educational content is the same, though there are extra responsibilities associated with this career option. Each state has licensing requirements that include safety standards, child-per-adult limitations, and background checks. Nannies: Working mostly in the homes of the children they care for and parents that employ them, nannies may be responsible for driving children to school, appointments, or after-school activities. Some live in their employers’ homes, while others may work for more than one family. Babysitters: Also working in the homes of the children in their care, babysitters typically work for multiple families instead of just one. Babysitters take care of children on occasional days and nights when parents have other obligations. You must be at least 18 years old with a high school diploma or GED. You need to have a minimum of 480 hours of working with children. You must have at least 120 clock hours of formal childhood education within the past five years. Some states and employers will ask that you have a nationally recognized credential, such as the Child Development Associate certification. There may be a certain amount of annual training hours required, it depends on your state. Note: States do not regulate nannies and babysitters, so hiring will be based on the employer’s preferences. The average hourly pay for child care workers is just over $10/hour, which translates to a little over $20K annually. Employment growth is expected to be at 7 percent through 2026, which is considered to be average. Locate a special education program near you. Find out about popular and extraordinary careers in special education. As a special education teacher, you’ll be working with students who have emotional and physical disabilities. You’ll be met with challenges, to be certain. Your education, along with your caring and empathetic personality, will prepare you to meet these head on. The special education course curriculum is taught at the pace of each student, plus you’ll work with students to develop basic life skills that can help them function beyond the classroom. To begin your career as a special education teacher, there are a few basic steps you need to go through to get there. Attending school full time, you should be able to complete your bachelor’s degree in four years. Get your bachelor’s degree in special education. Find a part time job or internship where you’ll work with special needs students in a classroom. Consider getting a master’s degree. There are some special education programs available on the master’s level such as special education with an emphasis on teaching children with autism, hearing problems, speech problems, behavioral disorders, traumatic injuries, emotional disturbances, or blindness. 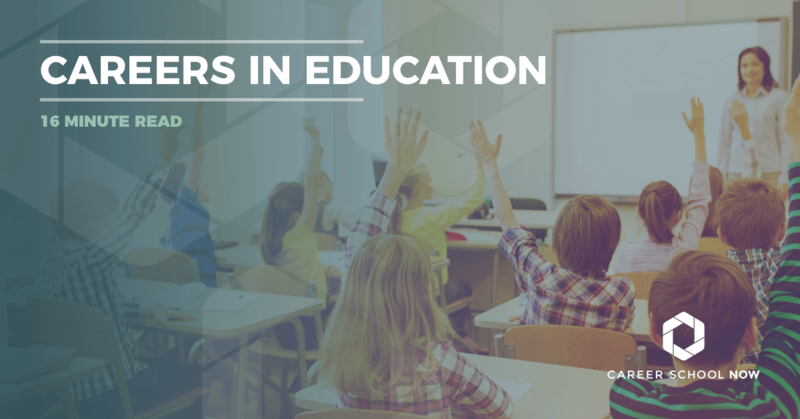 Some states may require you to have a master’s degree in order to become a fully certified teacher. You can expect a median annual salary of more than $58K if you are a special education teacher. Just starting out, you’ll make around $37K; at the top step, your average pay will be over the $95K mark. The career of special education is expected to grow 8 percent through 2026, which is about as fast as most other occupations. Vocational education focuses on the trades and lends knowledge in fields like welding, culinary arts, and cosmetology. Whether your students are interested in working under the hood of a car or with patients at a doctor's or dental office, you are the expert. It is your responsibility as a teacher at a vocational college or trade school to lead them down the path to their dream career. Most career and technical education teachers work in public schools, including middle school, high schools, and two-year colleges. Others work in technical, trade, and business schools. Experienced teachers can advance to become mentors and help less-experienced teachers to improve their skills. Teachers may become school counselors, instructional coordinators, and principals. These positions require additional education, an advanced degree, and certification. Before you can work as a vocational education teacher, there are a few basic steps you must take. If you go to school full time, you should be able to complete your bachelor’s degree in four years. You may be able to get a job teaching without a bachelor’s degree if you have several years of recent career experience. Get a bachelor’s degree in the subject you are going to teach. Complete your student teaching program. Get your state teaching license. If the subject you teach requires you to have a license, such as welding, then get that license. The average annual salary for vocational teachers is $55K. As a new teacher, your salary will be in the low $30Ks. You’ll top out in the $80Ks. Slower than average job growth is expected through 2026, due to not as many students enrolling in trade schools. Find out more about online colleges and whether or not they are a good idea. Online degrees provide students with the convenience and flexibility needed for a healthy work-life balance. Online degrees can also cost much less than traditional college. However, online-only bachelor’s degree and certificate programs in education are not offered by all schools because of the required student-teaching semester component. While online degrees make it possible to complete educational requirements, it is more common to achieve the add-on certificate and graduate degree programs for current teachers. These programs can lead to a salary increase or may qualify teachers to work in a new area. When looking at schools, either a physical or online facility, it is important to make sure you choose one that is accredited by the National Council for Accreditation of Teacher Education (NCATE). NCATE accredits both undergraduate and graduate degrees and is recognized by the U.S. Department of Education and the Council for Higher Education Accreditation. Attending an accredited school is critical if you wish to complete your teaching certificate in the state where you plan to teach.